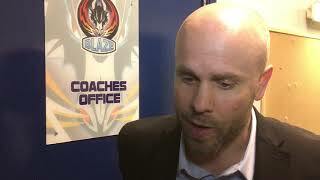 Czech netminder Miroslav Kopriva stopped 25 of 27 shots to earn a second consecutive Man of the Match award as the Genting Casino Coventry Blaze produce an outstanding performance to beat the Sheffield Steelers 5-2 at the Skydome Arena. Great Britain defenceman Davey Phillips opened the scoring early for the Steelers (2.26), but that was about as good as it got for the struggling away side, as Blaze took over the game from that point onwards. They had to wait until 16.44 to tie the score though as for the second night running, they were faced with a goalie, this time Jackson Whistle in scintillating form. The Brit, who stopped 37 of 41 shots on the night being beaten first by defenceman Chris Joyaux, his first of the season. 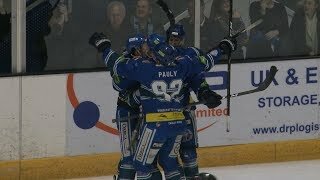 35-year-old Alex Nikiforuk next celebrated his birthday in style, finding the back of the net just 15 seconds into the second period (20.15) for 2-1. Tanner Eberle, who was voted Man of the Match for Sheffield tied things up again (37.41), later missing the net on a penalty shot opportunity. Before the middle period was done, Blaze again took a deserved lead on a 5-on-3 opportunity, Justin Hache beating Whistle for 3-2. The final period was again all Coventry as Jake Hansen made it 4-2 (55.04), the American then sealing the deal with an empty net goal (59.29) for a final score of 5-2.